This bruschetta-style chicken and mushroom skillet recipe is easy and delicious. Just how easy is it? 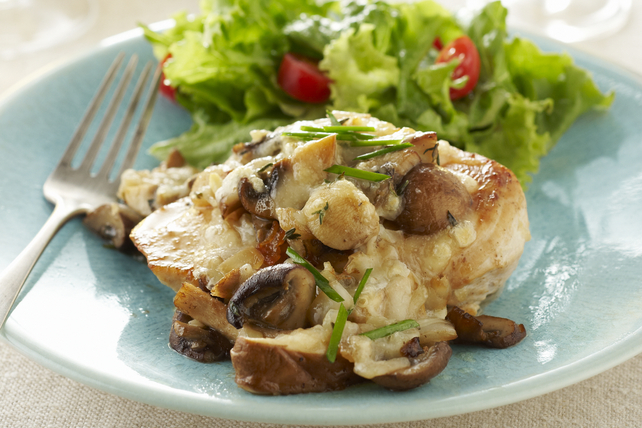 This mushroom-topped chicken breast recipe is prepared all in one pan - how easy is that? Cook mushrooms and onions in large skillet sprayed with cooking spray on medium-high heat 10 min., stirring occasionally. Add dressing, garlic and thyme; cook 2 to 3 min. or until fragrant, stirring frequently. Transfer to bowl; cover to keep warm. Add chicken to skillet; cook 5 min. on each side or until done (170ºF). Prepare using 2 pkg. (1/2 lb./225 g each) sliced fresh mushrooms. This tasty recipe, which can be part of a healthy eating plan, is sure to become a new family favourite.